The fifth episode of graphic novel series ‘Mujib’ has hit the shelves on Friday, 7th September, 2018. 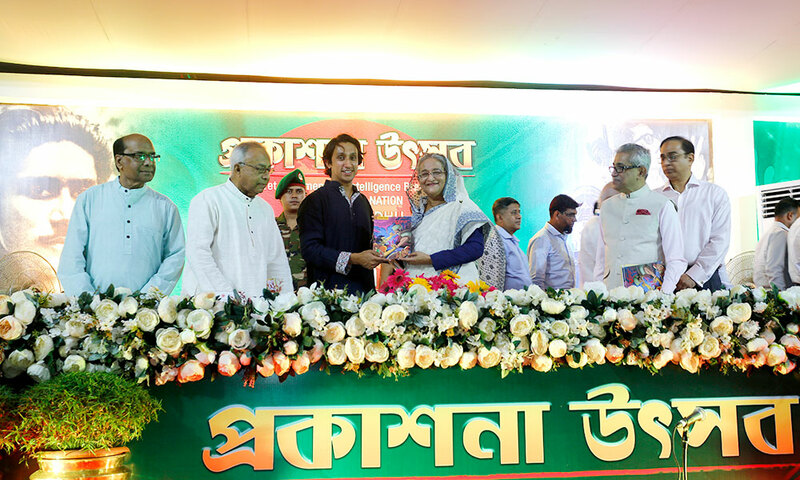 Honorable Prime Minister Sheikh Hasina unveiled the fifth episode of graphic novel at her official residence Gono Bhaban. The entire graphic novel series is based on the “The Unfinished Memoirs of Bangabandhu”, written during his imprisonment. The publication is initiated and published by Centre for Research and Information (CRI). Prior to this event, Honorable Prime Minister unveiled the ‘Secret Documents of Intelligence Branch on Father of the Nation Bangabandhu Sheikh Mujibur Rahman’ Volume-1 (1948-1950). The 5th edition of Mujib graphic novel illustrates how Bangabandhu, in 1945, was denied his deserved post in Chatra League, the student wing that got no other election until 1947. At the time, the World War-II and the black market that some vested quarters created by cashing in on the war, put the country in turmoil. To make the situation worse, some distinctive groups of the country paired with the conflicting interests among Khan Bahadurs paved the path for the British governor to take over. This was the situation that sparked the zeal of young Mujib to rise in response to the situation and make a difference. The 4th edition of the graphic novel series Mujib was unveiled on 17th February, at the Amar Ekushey Book Fair 2018. ‘Mujib-4 Delhi Adventure’ tells the story of Bangabandhu’s journey to and from Delhi to Calcutta. It highlights Bangabandhu’s experience attending the then Muslim League’s annual conference and the meeting between Hussain Shaheed Suhrawardy and himself, along with his fellow Chatra League activist. After visiting some historic sites, the young Mujib his two other associates found themselves running out of money to buy the return tickets. The 3rd edition of the ‘Mujib’, was unveiled on 19 February, 2017 at Amar Ekushe Boi Mela (Book Fair). ‘Mujib-3’ highlights the post-World War II period of the life of Bangabandhu Sheikh Mujibur Rahman, when he emerged as a rising politician and successful organizer despite many obstacles. It was under the vision of Radwan Mujib Siddiq, Trustee of the Centre for Research and Information (CRI), that the ‘Mujib’ graphic novel series was created, with the aim to sensationalize and educate the young children of Bangladesh about the Father of the Nation Bangabandhu Sheikh Mujibur Rahman. The colorful graphic illustration and visualization used in the ‘Mujib’ series was done by artists Syed Rashad Imam Tanmoy. This graphic novel series presents the political activism, successes and political wisdom of Bangabandhu in a youth friendly manner that also appeals to adults and comic book enthusiasts alike. The series has been selling well since the release of the first edition and the excitement continued with each new release of the Mujib series. The series has gained immense popularity with countless young readers, creating a lasting impression, shaping their values and making them politically informed. Professor Emeritus Rafiqul Islam chaired the unveiling event, Radwan Mujib Siddiq and Bangla Academy Director General Prof Shamsuzzaman Khan were present at the event, among others.